If you think you are going to get out of those mundane cleaning chores by trading in your current lifestyle for one pedalling down the road, think again. There is one key guarantee for getting the most out of all your cycling and camping gear and that is keeping it clean and well maintained But like housework, this responsibility is kinda dull and you know what they say about housework: it's never done. We began with all the enthusiasm of newly hitched cycle tourers: polishing the bikes until they gleamed, covering rust with paint; lubing chains and cables; wiping the tent down regularly; sewing every little hole and fixing every minor breakdown as soon as it occurred. And now after all those years on the road? Well, I guess it's just like the housework: most things are left until absolutely necessary. But like the satisfaction of the freshly spring-cleaned house, something has to be said about keeping your cycle touring gear clean and in top working order. A couple of touring-pertinent and quirky cleaning tips that we have discovered along the way. 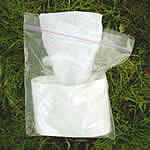 An Ozzie friend once told me about this toilet paper trick and I'm sure that most backpackers already know the secret. At first, I thought she was totally mad and that removing the inside carton roll wouldn't make any difference to its bulk and ease of packing in the travel bag. But there you go, I was horribly wrong and for those of you that have never tried it: it's a great way to cart toilet paper around the world with you. What's more, if you put it inside a ziploc bag, you've got yourself a nifty little dispenser too. Take cardboard roll out of the middle (can be a slight perseverance task, depending on the brand). Flatten the roll, making sure the middle piece of paper is sticking out. Place in sealable plastic bag and voilá. This cool travel toilet roll dispenser squashes up really neatly into the tiniest of spaces of any bag. Pull the paper from the middle each time and this keeps the dispenser action going. You will never need to get the loo paper out of the bag again. Pretty handy considering some of the grotty toilets there are in this world and anyone who's camped or travelled on a budget will know exactly the benefit of that. After a sweaty day's cycling, there's nothing like a hot shower. Unfortunately, water is not always available nor is it suitable for cleaning in. 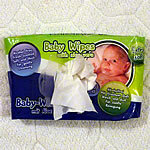 Lucky then for the common sanitizing hand and face wipes which are available the world over, come in the handiest sized packets and are the next best thing. The example on the right, from a Dia store in Turkey, has fifteen sheets which lasts us between four and five days. A simple solution to the "no available shower" scenario and while you can't wash your hair with them, they really do make you feel cleaner and fresher. If you do have the luxoury of a river running past the campspot or a bit of spare water, but are positioned such that you don't feel comfortable with stripping off and cleaning yourself in an open space, then arm yourself with flannel and soap, place the kitchen sink - yes we do love this product - inside the tent; on top of a tea towel; and clean away. You'll figure out all the necessary contortions in order not to make too much mess, but hey, a bit of splashed water on the tent floor means it gets a decent wash too. I didn't discover the benefits of travelling with deodorant cream until I reached Brazil. That was nearly four years into our bicycle journey and gosh knows how many roll-on and mini-spray antiperspirants later. Perusing the personal toiletries on the supermarket shelf one day, I noticed that "desdorante creme" were way more popular than the average Rexona roll-ons. You only need to apply the tiniest bit with your fingertip and without a word of a lie, you'll stay fresh and dry all day long, even after the hardest of cycling conditions. And while we are on the subject of buying deodorant, if you happen to travel to Japan, then take plenty with you. Using antiperspirant and freshener sprays are not customary. You will find it incredibly difficult to even find a roll-on, let alone be able to afford it if you do. To some extend the same applies for South Korea, but I did manage to source something half decent. I do remember paying way too much for it though. Our twisted elastic washing lines - yes, we have two - come out every day when we camp and are quite often decorating our bath- or bedroom too. Sure, you can use a piece of string, but the versatility is not as great as an elastic washing line. And besides they are so cheap that should you end up not using this laundry item, passing it on to someone is not going to break the bank. I can't speak more highly of this little addition to the travelling laundry. no pegs: simply tuck your stuff between the twisted elastic - this is just the best bonus! won't damage trees like rope can, especially when left behind in campgrounds. 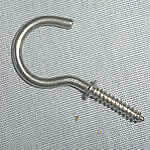 Whether you have a Bungee Clothesline or not it is still a good idea to carry a couple of metal screw hooks with you too. When you are faced with bare walls and no official attachment points for the clothesline or mosi-net, you can usually find a spot somewhere in your room to fasten these to. A couple of brands have suction cups on either end to fix to smooth wall surfaces, though you'll hardly be hanging a full washing load on these. In England about 12 years ago, we found the perfect bungy cord. 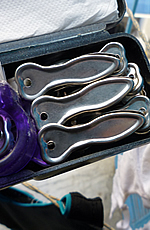 They are made with a virtually indestructible plastic mould clip which also has the advantage of not bending out of shape, rusting or making unwelcome holes in your luggage like the common wire hooks. We tried to find them again for this trip and in the process came up with a cheaper and even better solution. 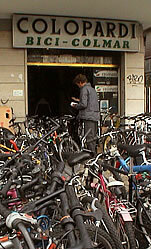 An online bike store in the Netherlands was prepared to stock the plastic clips and the elastic. So, we made our own and the beauty of this is, you can customise the length. If you are interested in doing this yourself then order your hooks and elastic from Bike4Travel here. And as soon as you pedal into camp at the end of a cycling day, you can twist your two self-created cords together to make your own Pegless Bungee Clothesline. But maybe you just want to give the Coghlan's Pegless Bungee Clothesline or the Sea to Summit Lite Line a go, I'd be curious to know how they perform. While we hardly ever use our pegs, they do come in handy when we wash the inner tent or if the wind is really strong. 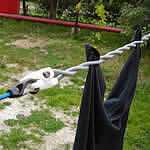 Some cyclists like to hang their washing off the bike and I seen this done with pegs as well as with bungee ropes. So, if you are like us and insist on taking a few pegs along for the ride, then the lightweight stainless steel type travels the best. Firstly, they don't rust and secondly their design is extremely compact yet durable. We found ours in a shop in Thailand for a dollar back in 1998 and they have survived plenty of loads of washing. Which wash bucket do you have? Before writing this section about on the road washing tips, I thought I'd better check internet to see if I had been travelling all these years without knowing some sparkling well kept secret. Turns out there was nothing inspirational to find out at all. But what I did bump into were several articles outlining how to wash your clothes in the shower. I thought every budget traveller knew that. You know the essentials: just take one or two pieces in with you every night so your laundry doesn't pile up and certainly don't let hotel owners know. But what if you have just come in from 5 days in the desert, you and your clothing stinks and you've got to give both a good ol' soak? Firstly, you are going to need some sort of bucket. The kitchen sink from Sea to Summit, I will once again herald as brilliant for this purpose. Honestly, don't leave home without one. But what if you do leave home without one? 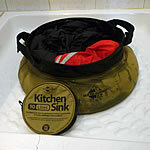 Don't panic, there are two simple solutions at hand: The bike pannier wash bucket: Now, this is a great idea if you have waterproof bike bags like the Ortlieb Roller Classic and you don't mind emptying them completely out for a few hours. Some loaded cyclists have been rumoured to filling the pannier with clothes soap and water and set off on a ride. Sort of like a portable top-loading washing machine: a bumpy track is preferred for extra agitation. Though exactly how heavy the bags might get with a full load of washing is a little daunting. Nonetheless, its a wash bucket and not only do you get to do your laundry, but your pannier gets a thorough clean as well. The bag bucket is nothing more than a couple of strong plastic shopping bags. The only trick is to get the bag to stand upright. Best spots include in the wash basin, nestled inside a waste-paper basket in the bathroom, a sturdy box or wedged in the shower corner. And the use of a plastic bag doesn't stop there. Providing the sink in your hotel room has a hole, they are great for stuffing down the drain and acting as one very efficient plug. I have to step up here. I'm sorry, but if there is any "blinking neon message" received during the last few years of cycle touring, it is how absolutely precious water is. And since washing generally involves water, I need to stress the importance of doing this chore with the environment in mind. We all need to start using biodegradable products. Sure, sometimes it is an emergency: you are in the middle of no-where, not a stitch of clothing left and you have only one choice; a not so ecological choice; a choice of buying the chemically laced washing powder with flouro blue bits or stinking the tent out. Of course, you buy it. But the issue here is: when possible, buy environmentally friendly products. Mother nature will thank you. Just think about it this way: every living thing depends on water, which means you too. Every country in the world faces problems of polluted natural water sources. One of the main offenders is soap products. Please help our planet, by buying some of the following cleaning merchandise either from here online; at your camping store; your local health shop or supermarket. Sea to Summit has an excellent range of Liquid Soaps and Trek & Travel Pocket Soaps. A sound product for all types of washing and personal cleaning available at Rei.com: Dr. Bronners Pure-Castile Bar Soap. Austin House Bio Suds comes in a handy 100ml tube and lasts for about 20 washes. It does contain whitener and fabric softener, so it is not really suitable for moisture wicking or water repellant active wear. Soap Sheets are an amazing revolution in travel laundry cleaners. They are not only ridiculously compact and lightweight, but they are biodegradable too. enter a local Health or Bio-shop - they are everywhere in the world these days - and buy a cake of simple or pure soap. You can usually find these products in the laundry or personal care section of supermarkets too. Find some soapberries or soap nuts. They grow in Asia and some parts of Central and North America. Although an alternative washing method, it could be fun to try. Related to the lychee family, the fruit is not eaten but used to make soap instead. 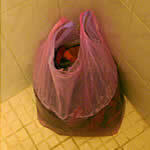 A few nuts in a drawstring bag lasts for several washes and a more natural source of laundry detergent you cannot find. 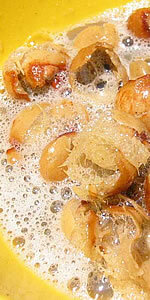 Available at Amazon in larger quantities under the brandname: Maggie's Soap Nuts 100% Natural Laundry Soap. Want to know what some of the eco-friendly soap brandnames are or even how to make your own products? Have a look at the Less Toxic Guide from Canada. 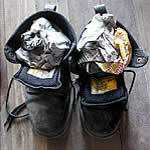 Got this great tip for smelly Tevas from the Wereldfietser Forum. 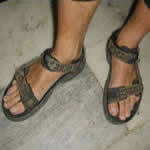 Tevas are renowned for stinking. Ask anyone who has ever owned a pair. The suggestion of soaking your sandals overnight in a bucket of reasonably concentrated Dettol solution as well as giving them a bit of a scrub in the stuff will get your Teva's saying pretty fresh for at least a month. It does really work. Dettol however, is not completely eco-friendly. It contains pine oil, castor oil and chloroxylenol. While the oils aren't toxic, the chloroxyenol is rated as a medium toxic substance. So if you are looking for a more natural alternative to this cleaning tip, then make a paste of bicarbonate soda, lemon juice and plenty of tea tree oil. Rub the Tevas thoroughly in the paste and leave them to rest overnight. Scrub off the residue the next morning. They will smell clean, but the freshness doesn't last quite as long as the dettol method. Sleeping bags? Which way down? The travel bedroom is as much a personal choice as the bedroom you left back at home. So, it is pointless debating with me about whether a down or a synthetic sleeping bag is better. I don't really care what the next guy says, because I have a down sleeping bag and I absolutely love it. And since there is already so much written about the ins and outs of this travel related topic, I'm not even going to head down that street. If you want to take a stroll, feel free to look at the following fairly neutral articles. You will undoubtedly be sent in the right direction to find a sleeping bag: one you will develop a real soft spot for. Store loose, not compressed. Hanging upside down from the ceiling or in a well-aired wardrobe is optimum. Keep it clean and dry, especially if you are about to put in storage. Sleep in your clothes or use a silk liner to prevent sweat absorption and damage from body oils. When staying in hotels, regularly pull the sleeping bag out of its compression sack to air it and keep the feathers lofted. While travelling hang your bag out to air and get some sun whenever the opportunity arises. Give it a gentle beating with a pole or stick to get dust and sand off. Whatever you do: Do not dry clean. This removes natural oils in the down and insulation will be decreased. A front loader is better than top-loading washing machines with an agitator bolt - though I have used both successfully and when you are on the road, you can't always be choosy. The bigger the load capacity the more thorough the wash and the less chance of damage to the bag. Fully unzip all openings and loosen cords. Arrange evenly and loosely as possible in the machine. A synthetic wash cycle is fine: warm (30°C) wash + cold rinse - you could just use cold water too. Ensure all the soap is well rinsed out of the sleeping bag. An extra spin cycle will help remove excess water in the down. Dry thoroughly in a dryer on a low temperature setting for at least two hours. Place a couple of clean tennis balls in the drum to assist with declumping the down. Alternatively you can hang it out on a windy and or sunny day. It is best to spread the bag over several cord lengths since it will be very heavy. And here is the catch: this drying process can take anything up to four days of hanging outside and then a further week inside over a clotheshorse. If I have access to both of the above drying methods at the same time, then I alternate between them. Want to know about more tips for the camping bedroom? 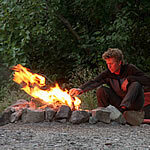 See our camping tips page. What does our outdoor bedroom look like? Check our bike touring equipment reviews. For most cycling tourists, their tent becomes their home for a large part of the journey. And therefore it stands to reason that they want to keep it in reasonable condition. One of the best ways to achieve this is to keep it clean and store it properly. That may sound simple enough, but it does take a bit of discipline to stick to all the mundane chores while you are still on the road. Most cleaning tactics are fairly obvious, like sweeping the tent out each day and before you pack it up. Dirt, but especially sand has a habit of destroying fabrics and zipper action. A ground sheet or footprint will add to your tents protection, though during heavy rainfall, this should not be sticking out further than your outer fly, otherwise the plastic can guide water into the inner tent area. Also cleaning off any sap or bird droppings goes without saying. If you rather the sand, mud and dirt stay outside the tent, then why not set up a little doormat in the opening. I'm not suggesting that a loaded cyclist cart a piece of rubber carpet around with them, but instead use the resources around them. On occasions we've cut up shopping bags, found old planks of wood or concrete slabs, cardboard, dry pine needles are also effective as are stones and gravel. This little precaution really does help keep some of the grime elements out of your tent. Probably the biggest issue with tents is not to pack it away wet. Unfortunately, this is virtually impossible to avoid when you are touring for the long term, so make sure you remove the tent the same day to air and dry satisfactorily. Not doing this can lead to mould which in turn causes your tent to smell and loose its waterproofing qualities. It also stains as we found out recently in Brazil. The black cross like spots we will never get rid of, but we did successfully stop the mildew growth and remove the spores. There are several cleaners on the market like McNett Mirazyme, but we were in no position to source something like that, so I made a paste of fresh lemon juice (could use white vinegar too) and salt and rubbed it into the affected area and let it dry in the sun. After waiting for a half hour, I rinsed it off and repeated the process again. You may also want to waterproof the area after you have finished this procedure. You should avoid using detergents on your tent. Most of the time just a sponge down with a damp cloth is all it will need, but if you feel you want to really give your outdoor home a spring clean, then use a mild soap or something like McNett Tech Wash. The inner tent you can wash in a bucket with luke warm water. It is not advisable to put your tent in a washing machine, nor should you machine dry it. There are a whole range of outdoor cleaning products available from McNett-outdoor.com as well as plenty of helpful hints on keeping your camping gear clean and repaired. Repair tricks for the tent? Have a look at our camping tips page. Want to know whether we'd by the same tent again?Read our bike touring equipment reviews. More about the primus camp stove on our cooking tips page. Want to know what we think about our primus camp stove? See our bike touring equipment reviews. Cleaning kitchen gear doesn't have to be a chore on the campground nor out in back country environments. Here's a couple of hassle free travel tips for washing-up the pots and pans while on the road. badly burnt pots and pans: drip a dribble of biodegradable dishwashing liquid or add two heaped teaspoons of cream of tartar in the pan and cover with enough water to boil for a few minutes. Similarly you can sprinkle a bit of baking soda over the bottom and add some water to make a paste and let stand for a few hours before cleaning. campfire protection: rub the outside of your cookware with either liquid or bar soap before putting them over the fire. Smoke and soot rubs off with the wipe of a rag or tissue after cooking. without soap: mix clean riverbed sand or light gravel with a bit of grease or oil and some wood ash from a fire. Add a teaspoon or two of hot water to make an abrasive paste. Some people use warm coals from the fire instead, but either way, be careful as the cleaning paste can be harsh on the hands. The combination of these products causes an acidic reaction. Rub it over all your soiled cooking and eating equipment - it looks like you've made even more of a mess - but it does work. Rinse clean, well away from a water source, not forgetting to clean your hands afterwards either. rationed water: immediately after serving or eating, wipe cooking gear with a disposable wipe or toilet paper before the remaining food particles hardens. It will be easier to clean and stop the little water you have from becoming dirty too quickly. no water: wipe pots clean with a wad of grass, pine needles, straw or compressed dry leaves first and then finish off with cleaning tissues or toilet paper. You could also use some antiseptic gel if you like. contamination worries: heat pots and metal equipment on cooker before using again. This is probably the most well-used technique by cyclists and hard-core campers that I know of. The "lick it clean" method not only wastes no food, but it saves on water dumping and usage too. And believe it or not, some purists even go as far as to add a bit of water to the pot to assist in getting everything off the sides and then drinking the slops. This even has a name: the big gulp. While this "waste not, want not" method significantly promotes "no trace camping", its not a habit I'll be using regularly. More tips for the outdoor camping kitchen on our cooking tips page. Want to know what cooking products we take around the world? Bike touring equipment reviews. We've camped all over the world and picked up plenty of tips: see our camping tips page. Bike maintenance is important, but sadly the motto in our camp is: "if it ain't broke (or almost broke), don't fix it". Sadder still, we have a similar attitude towards keeping our bikes clean, though, this is one of the best methods of keeping your cycle components optimally working for longer. It will come as no surprise, that I'm not going to preach about what you should do in terms of keeping it clean. Instead, I'll direct you straight to BicycleTutor.com, where you can virtually learn to become a qualified bike mechanic online. All the answers to your questions are there. 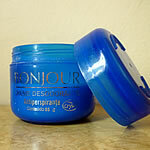 But you can also find the same product but for at least half the price in some health and beauty or wig stores. C-22 Citrus Solvent can also be used as a glue remover. And for all those lovers of nifty little tricks, here's a bike cleaning technique I discovered, quite by accident. To my surprise I found a sure fire way of getting all that gunk out of my cassette without too much hassle or mess. And all I needed was a shoelace. Just wrap it around the first cassette cog and hold in place like a chain. Pull each side alternatively towards you in a rhythmic motion. If you get the right tension and angle, the shoelace will easily work its way through each gear. Keep doing this until all the grease and grime is removed. It is guaranteed to get right down in between each cog. If you soak the shoelace or spray the cassette with a bit of citrus solvent first, the job will be done in no time at all and with virtually no grease on your hands afterwards. Keeping dry while cycle touring is something that will occupy plenty of thought and planning. 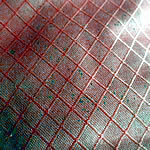 The first obvious tips are to get good wet weather riding gear with reflectors. While shoes and caps are important too, there is one rain garment that stands alone when it comes to cycling comfort. And that is the jacket. Firstly, it must keep the water out, but at the same time breath enough to keep you at a reasonable temperature There's no point on repelling the rain if you are dripping from sweat inside. Again, there is mountains of information to be sourced on internet, but one article I stumbled upon is not only concise, but it has thoughtful points that have obviously come from someone with a bit of experience. Choosing a jacket to keep you warm and comfortable is written by Mary Blomquist. Her website has plenty of other brilliant resources to keep you occupied for hours. So now you are totally high and dry with your new waterproof cycling jacket, lets discuss a couple of other tips for keeping the rain off your cycling kit. Beside the obvious, newspaper has a multitude of roles so we always carry a few sheets with us wherever we cycle tour. Stuff it -very wel - into wet shoes to absorb the moisture. It is an efficient way of drying those soggy boots and if they still happen to be a little damp the next day, line the bottom with a folded sheet. Keep a bit on standby to replace throughout the cycling day. On a very cold day, you can wrap newspaper around your feet and place them inside your shoes to keep them toasty warm. For the pannier bag that is getting a little worn, place a folded newspaper sheet in the bottom. Layer a plastic bag on top and you'll prevent your gear from getting wet in really bad weather. In an emergency it can be used to line the inside of a leaking inner tent, or the front vestibule. It is good for starting a campfire. 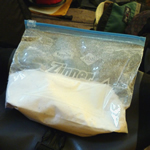 So what is the appeal of carrying a chamois with you on the next loaded bike trip? Mops up spills really well, obviously. If it has rained, you can completely wipe down wet bags and gear before putting in the dry tent interior. Great for drying off park benches and picnic tables when stopping for a roadside snack. Removes condensation from the inside of your tent. 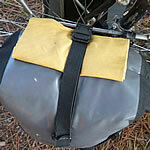 Sits neatly on the top of a pannier for easy access or inside in a ziploc bag when not needed. And you always thought that the shower cap was nothing more than a means to keep grandma's hair dry. Well that is not entirely true, because there are a few cyclists out there that make good use of them too. 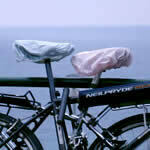 During a damp evening or if it rains when you are not using your bicycle, a shower cap keeps your seat clean and dry. It can also fit over the top of your handlebar bag, for a bit of extra waterproofing. And the real beauty of the shower cap is, they are available worldwide for next to nothing. Very simple ideas brought over from the bedroom dresser at home to the cycling pannier bag on the move. It needs little explanation. 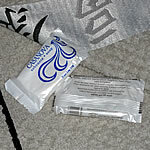 Stash a couple of those little complimentary soaps in the clothings bag to fragrance the clothes a little. If you happen to run out of soap at any time: voilá you have an immediate supply.